What is your favorite go-to spot in your house? Is it a room that is always buzzing with activity, or a room where you can just relax? I’ll bet it is a room where you can go to just unwind at the end of the day. The living room might be that go-to spot, for there your comfy easy chair reposes and you can stretch and ease your legs onto an oversized hassock near the natural light of the front room window. Maybe the television set is on, or perhaps you use the living room to catch up on reading or do some woolgathering. Think about the ambiance of your living room for a minute or so – is it warm and inviting or is it sedate and elegant? A less-formal setting is more restful and relaxing where a stiff and formal setting is not very welcoming. We always considered living rooms to be a place which we showed off our style and good taste, and in order to achieve that quality, the room had to have dark furnishings and heavy drapes which hung to the floor, paneled walls, dim lights, and, in general, a rather austere look. The contemporary look for living rooms is walls painted in neutral tones, light and airy window treatments, natural wood floors and upholstery in light-colored fabrics. Since the weather is so temperate in the Phoenix area, it should follow that we would want that beautiful sunshine to come pouring through large windows with sheer draperies. Arizonian’s living rooms now flaunt a wide palette of colors, many designed to reflect the region we live in – the beautiful colors of a desert sun or the natural tones like sand and sage. 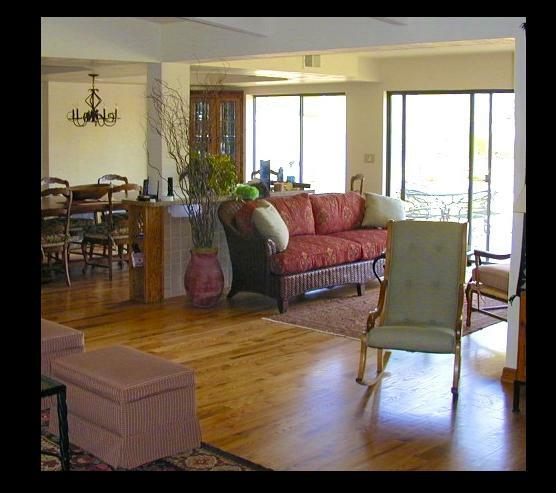 Sometimes we design a whole room, like a living room, to capture that Southwestern living theme. But there are always new trends and color combos to try out. If I’ve piqued your interest, here is a short list of some of the new living room design trends. If you would like to explore more trends, why not consider consulting with a home remodeling expert Phoenix? Kiss goodbye to boring and blah living rooms. The living rooms today come to life with colors and color combinations like dark melon with white wooden accents or even white-on-white, a rather elegant and understated look and easy to pull off, simply by using different shades, as well as textures, of the color white. For example, you might have a linen sofa, a crocheted throw and a nubby rug. A few “pops” of color in a neutral scheme or a dash of color on white is a welcome addition to neutral-colored furniture and light-colored rugs and is very trendy. Feature wall – A new trend is the use of a “feature” wall or sometimes called an “accent” wall. 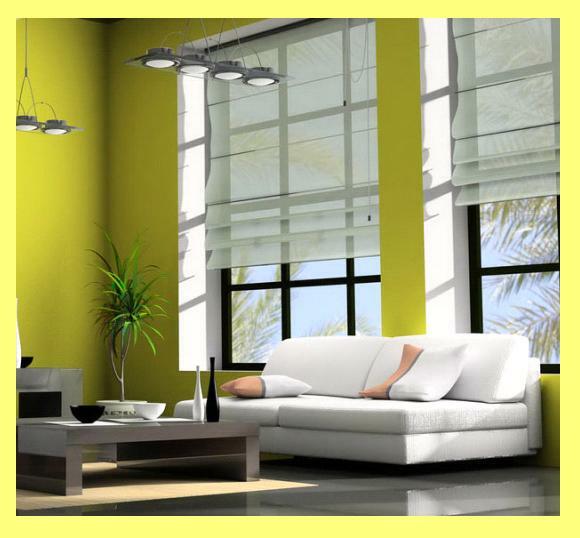 This concept is when three walls are painted the same neutral color and the remaining wall is painted a contrasting brighter or darker color. It is not always simply a different wall color. Sometimes the feature wall is used as a focal point in the room. Maybe a large piece of artwork will hang there or perhaps an entire wall of photographs in a variety of frames. Sometimes shelving units with knick-knacks or collectibles will take up the entire feature wall. In larger homes, a feature wall might consist of a solid wall of library books with a rolling ladder utilized to access even the tallest bookshelf. Light-colored furniture – With year-round, warm weather here in Phoenix, trends are now straying from dark-colored furniture and moving toward neutral-colored furniture or even Lucite tables. Minimal furniture – Minimalism is one of the most contemporary looks of this century. We can’t always simplify our lives, but we can simplify our homes. What about minimalizing the furniture in the living room? The current trend is to ditch the traditional sofa and the one or two large matching chairs. Now, you might have one high-backed chair near a large window with a small table nearby on which sits a pewter reading lamp. Sometimes a few oversized pieces of furniture are scattered around and this depends primarily on the size of the living room. A large living room, of course, can accommodate more of these often mismatched items. Several large, oversized hassocks keep your living room from being overwhelmed with an overstuffed sofa or the ample seating of a sectional sofa. Often, the only other piece of furniture might be a tall, old-fashioned secretary accompanied by a high-back chair to catch up on correspondence, electronically or even by snail mail. Another trending furniture item is the heavy “game table” i.e. an extra-large, heavy coffee table which occupies the center portion of the room. A game table is designed with an edge around the perimeter to keep game pieces or drinks from sliding off the edge of the table. Monopoly anyone? Non-traditional sofas – If you have a very large room, you should consider using a concept of back-to-back sofas where the sofa backs are straight up against one another. Décor … new and innovative – Cool metal is a trending look, with silver accents in large picture frames and mirrors. Dare to show off your own personal style with quirky décor like enlarged photos, signs or posters which show off your personality, hobby or way of life. The Southwest-inspired motif – Maybe you would like to create a Southwest-inspired living room. You can choose Southwest-inspired accessories inherent to the region which will complement wall colors in any of the traditional desert colors such as sand, mauve, pink, and turquoise, yellow or burnt orange. Heavy tapestry wall hangings in bright and bold Aztec prints add the perfect touch to further capture the desert look. Vintage-style pieces such as rustic chairs, wooden artifacts, or hammered and stamped pewter or copper pieces will serve to complete the look. For genuine authentic flair, try adding real cowhide or even cowhide prints for upholstery, drapes or floor coverings and vintage-style pieces to capture the Southwest-inspired mood. A kiva fireplace, known for its shape of a beehive, may be placed into a corner, and is a classic way to incorporate a design from the Southwest. If you are interested in purchasing new living room furniture, you can extend the Southwest theme with the addition of Mission-style furniture. Sunken living room – If you were around in the 1960s you might remember the concept of sunken living rooms which are now experiencing a resurgence and may be created in any shape you want, not just the traditional rectangular shape. It is easier to design a sunken living room when a house is being built, as it will have an impact on the shape of the foundation; adding a sunken living room to a finished house will require foundation work, but it is doable. If a sunken living room is something that strikes your fancy, contact a home remodeling expert in Phoenix.